A series of book signings and tea tastings at Coffee Bean and Tea Leaf locations begins this weekend. 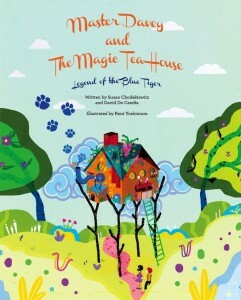 Children’s author Susan Chodakiewitz and Coffee Bean and Tea Leaf’s tea master David De Candia will discuss their collaboration on “Master Davey and the Magic Tea House,” along with illustrator Kent Yoshimura. The first event begins Saturday, Oct. 5, at 1 p.m. at the Coffee Bean and Tea Leaf in Long Beach, 4105 S. Atlantic Ave., Suite A. On Saturday, Oct. 12, the signing will be in conjunction with the L.A. Parent magazine cover contest at the Westfield Mall in Century City, from 10 a.m. to 3 p.m.
On Sunday, Oct. 13, the signing and discussion begins at 11:30 a.m. at the Coffee Bean and Tea Leaf at 1617 Pacific Coast Hwy, #103 in Redondo Beach. “Master Davey and the Magic Tea House” follows the adventures of Hopper Smith, a boy who spends his time watching Master Davey blend various ancient teas instead of the typical activities of kids his age, like playing tag and riding bikes. These experiences are all the more exciting as he learns to unleash the power of his imagination and follow his heart. However, Master Davey’s precious Blue Tiger Tea will soon disappear from the world forever, and Hopper must unlock the stories hidden in the tea and find the courage to face the fierce Blue Tiger. The book is available at Coffee Bean & Tea Leaf stores in the United States and franchises worldwide, as well as at www.amazon.com.